Brisbane's best public golf course. 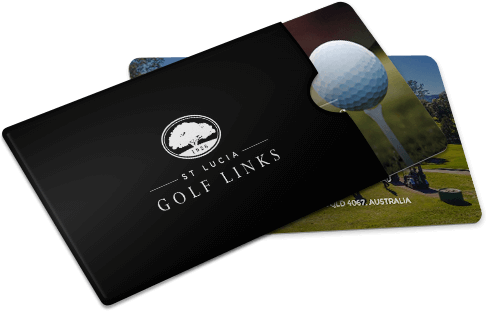 As a public golf course, St Lucia Golf Links has so much to offer – its scenery, facilities and iconic restaurant hundred acre bar at the top of the hill guarantees the best of outings. Perhaps it’s the beautiful breezes that roll up the hill, the tranquil surrounds of our restaurant and events space Hillstone encased in 364 plants, or the friendly patronage of our Swedish Directors Jens and Hans that make our location so special. Whatever your favourite features, St Lucia Golf Links transports you to a relaxing place completely detached from the city. Aside from its beauty, the course has been expertly designed and laid out over 5,411 meters (par is 69). Since it opened in 1926, it has been challenging and engaging golfers of all abilities – thanks to suggestions made by world-renowned golf course architect, Alister MacKenzie. Aside from playing on course, St Lucia Golf Links provides many more unique experiences. Whether you’re having your clubs fitted, playing in our golf simulator, learning from one of our expert PGA coaches, or enjoying a corporate golf day (coordinated by us), rest assured you’ll be well looked after. Our new Golf shop has everything you need for a day on the green. From apparel and equipment to gifts for friends, this shop is completely stocked. The Golf shop houses our innovative golf simulator, and is where all golfers check in before commencing their game. We want you to experience the ultimate joy of golf from the very beginning. With our special Golf Game evaluation, our golfing experts will talk you through your game and how you can improve – whether you’re after a quick fix or a long-term strategy to advance your ability. Golfers of all abilities are welcome to redeem this offer – phone 07 3870 3433. Book in for your golf game evaluation today. The GCQuad Golf Simulator Experience is our exclusive computer coach – the only one of its kind in Brisbane. Designed to provide precise insight into your golf swing, it’s a fun way to learn about your movement, game and overall ability whilst identifying ways to improve. Golfers can play courses worldwide including famous Pebble Beach. The simulator is also great for private functions as the golf shop is licensed and catered for by hundred acre bar on request. It’s open 7 days per week from dawn to dusk. Everyone has their own shape and way of movement, so personalised golf equipment is essential. Our fitting service collects data from our golf simulator and determines the best clubs and putters to keep you constantly playing your best game. Whether you want to swing into the real action or you’re looking to learn something new in a fun environment, there are lesson programs available for golfers at all levels. The programs let you advance on your own with a private coach or learn with a small group of friends. Our coaching starts with a focus on the 7 main golf shots you need to know to enjoy a game of golf. This gets you onto the green and playing your own games in no time at all. The lessons are also grounded on the golf course itself, meaning you won’t spend your first hours swinging on a driving range. We believe each new golfer should receive personal, expert guidance. Because of this philosophy, we mostly offer private and small group lessons so there’s enough time for individual instructions to sink in. Corporate events on our golf course are a fun and professional way to bring your company’s teams together. Along with a variety of corporate golf day packages on offer, your event can be tailored to your exact requirements. Our event coordinators and golf team have been running incredible corporate golf days for over 30 years. We will work with you in setting up every detail and ensure it all comes together seamlessly on the day. The competitions will challenge your employees in an encouraging environment. Then, it’ll be time to relax with a delicious meal or beverage. With numerous catering packages available for before, during and after the game, there won’t be a dull or hungry moment.